Please pass the peck of pickled Pickerel and Pike! I got it that nobody wants to step up an “run” the bragging tourney. 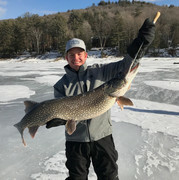 Since it is a bragging tourney post your fish anyway!